The Freeform Channel, formerly known as ABC Family, is running a Harry Potter movie marathon today. I had already been thinking a little bit about Harry Potter for some reason when I woke up. When I logged into Facebook, the newish feature that allows you to look back on posts made on the same day in previous years informed me that two years ago today, I posted a link to an article written by a writer who suggested that if J. K. Rowling really cared about writing, she should stop doing it and make way for others who couldn’t compete with her. The author of the article also suggested that adults shouldn’t read Harry Potter because it doesn’t “stimulate their minds.” It still makes me roll my eyes. First of all, I disagree entirely that it doesn’t stimulate my mind to read Harry Potter. Setting that argument aside, however, stimulating your mind isn’t the only reason to read. Sometimes you just love a book. It was almost as if the universe was giving me a little nudge for today’s Slice of Life. You see, I’m pretty much a ginormous Harry Potter fan, if you didn’t know that about me. It was a thing at my previous teaching job in Georgia, and the kids seemed to enjoy it. I haven’t publicized it as much in my current teaching position. There are a few reasons why, I guess, but none of them are that I’m embarrassed. I find those books to be a deep well that I can return to time again, like old friends. I first encountered the books at a time in my life when I wasn’t very happy. I was having trouble finding a job, for one thing. I had recently had a baby and was struggling financially for the first time in my adult life. I picked up the first book in either August or September of 2001. I rapidly read through the other three books that were published at that time: Harry Potter and the Chamber of Secrets, Harry Potter and the Prisoner of Azkaban, and Harry Potter and the Goblet of Fire. The first movie had not yet been released (but would be later that fall). After I tore through those books, it would be almost two years before I could read Harry Potter and the Order of the Phoenix, but the movies served to fill the void a bit. I do like the movies, though not nearly as much as the books. Some time after the release of The Order of the Phoenix, I started reading the books to my oldest daughter, Sarah. Sarah is now 22 and in college, but at this time, she was still in elementary school. We only had one car, and we had an awful commute–over 40 minutes one way. I felt like we spent barely any time at home, and as a result, the place we slept never really felt like home to me. After school let out, it was our routine to pick up Sarah’s younger brother and sister from daycare and get something to eat. We then drove to wait for my husband’s shift at cable broadcast facility to end. It was too impractical to drive home and have to drive back out to pick him up. The time and gas we would eat up wouldn’t make it worth it. Sometimes when I think back on the crazy couple of years we spent living this life, I can’t believe we did it. I have never had such a long commute since, and it’s my goal in life never to have another one like it again. While we sat in the car in the parking lot underneath a streetlamp, Sarah and I would read. We read all five of the books in this way. I remember before the scene when the Death Eaters come at the newly regenerated Lord Voldemort’s call that I warned Sarah it was scary and made sure she felt ready for it. She was. Even though this was a hard time, I almost felt like those books got Sarah and I through. It was something we shared. It was something we did together. I miss those times. Those books gave us something to hang on to when times were a bit hard for us. I might as well come out and share that I had some issues with depression, and these books somehow made it better, just for a little while. How can I not be grateful for that? Sarah’s sister Maggie and I have also read the books together. My favorite thing about Harry Potter has been sharing it with my family. My father and mother eventually became fans, and we went together to the midnight releases for the last three books. It was something we shared. It brought us together. And how can I not be grateful for that? Over time, I did think a lot about what the books had to say about education, and I pondered the merits (or lack) of Severus Snape (who actually is my favorite character). I named my cat Bellatrix. I joined Pottermore and was relieved when I was sorted into Ravenclaw. I was even interviewed about Professor Lupin on an Irish radio show. I wish they’d called me again to discuss Professor Umbridge when the fifth movie was released. I have a lot to say about her. 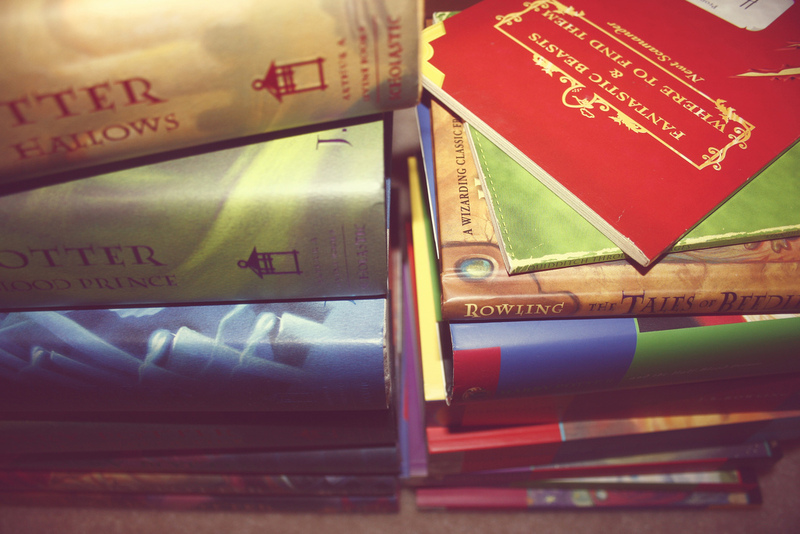 I tend to re-read the books at least every other year. At some point, every time I read the series, I am right back under that streetlight in the dark, sitting in the front seat of the car with Sarah, reading until her stepfather’s shift ends and we can slog home late in the evening to the place where we slept at night. 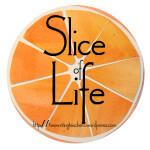 This is the best slice! I love everything about it, especially the cathartic effect of your reading experience. Never be embarrassed by what you choose to read, by what you love to read. I’m hiding because I haven’t read HP. That’s embarrassing. I’m hoping to read them w/ my granddaughter starting this summer. Glenda, I hope you enjoy them. It’s special to share with your granddaughter. *I* named that cat Bellatrix. That is true! So you did! Completely no pun intended: there is something absolutely magical about this series. I hope your new school finds out about the true you soon! Ha! It’s weird. It’s not like I’m trying to keep it some big secret or anything. It just hasn’t been out there like it was at my last school. I also adore Harry Potter. It is a foundational piece of the childhood of all three of my girls. The first book came out when I was pregnant with my first daughter. I read them to her until she could read to herself. When the last book was published, she and I both bought the hard cover at 12:00 am at my favorite independent bookstore. She let me read the last chapter aloud to her and we both bawled together. Nothing can replace those experiences. Wow! After that story, why WOULDN’T Harry Potter be a big part of you. I have read a couple of the books and can totally appreciate those who have made the series a big part of their memory collection. I hope you are enjoying that movie marathon. It sounds like a perfectly cozy way to spend a lazy Saturday. We had it running in the background. It’s been a nice day.